Valentine’s Day is all about love, happiness, and SWEETS! 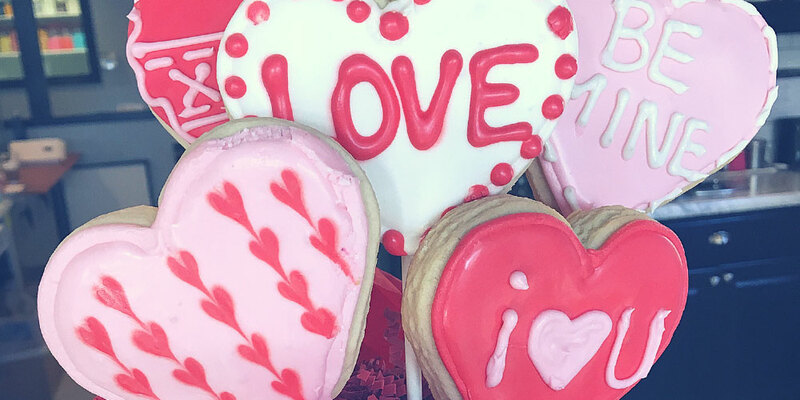 Who doesn’t want to enjoy a hand-decorated, heart-shaped, delicious bouquet of sugar cookies? Join our decorating class to learn techniques to deck out amazing designs that are sure to impress! Learn piping skills and have fun with your friends while we help you create a sugar-cookie bouquet! Minimum age for this event is 14 with an accompanying adult. Please note this event is BYOB. Small plates and appetizers may be brought. No paper products will be provided. A purchase of a ticket will include 6 shaped homemade sugar cookies on sticks, a valentines tin (styrofoam, tissue paper, etc. ), wrapped and tied with a bow. Aprons and all supplies will be available.